Budget double room on the second floor. Please note two flights of stairs. Views to the South Downs over the rooftops. Large ensuite bathroom with bath and a hand-held shower suitable for hair washing only. Beware tall people, the ceilings are sloping and there is restricted head height in areas. Double bed. Kingsize room on ground floor. Large bay window to the rear. Kingsize bed. Ensuite shower room. 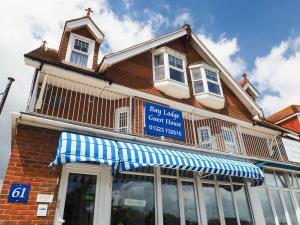 Bay Lodge Guest House is a small friendly bed and breakfast on Eastbourne's seafront close to the Redoubt Fortress and Pavilion Tea Gardens. Catering for adults only, it has six en suite rooms on three floors - one single and five doubles. The two rooms at the front have sea views - one having a bay window with window seat and the other a large balcony with table and chairs for guests to sit out in good weather. 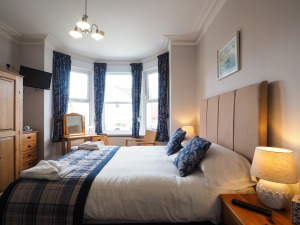 Each room has wifi, a flat screen TV with Freeview, iron and ironing board, lovely toiletries and a well stocked hospitality tray. Breakfast is served in the dining room between 8.30 and 9.30am - there is choice of cereals, yogurts, fresh and tinned fruit, fruit juices and plenty of tea and coffee. Full English (with local butcher's sausages and free range eggs), porridge, smoked salmon and scrambed eggs, croissants, cheese and ham can all be ordered. Special diets can also be catered for with prior notice. Parking is free on the roads nearby and there are also two off street parking spaces at the rear. By car: From A22 join A27 and follow signs for Eastbourne seafront. Turn right at roundabout at Sovereign Leisure Centre. Follow road along the seafront. The guest houses is opposite the Pavilion Tea Gardens and Redoubt Fortress. By train: to Eastbourne Station and then take a taxi.